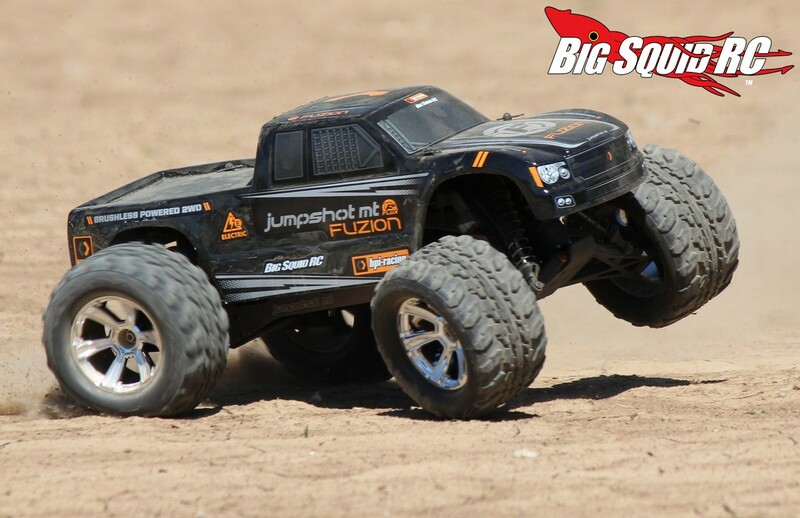 HPI Racing Jumpshot MT Flux Fuzion Review « Big Squid RC – RC Car and Truck News, Reviews, Videos, and More! Primary Competition: The Jumpshot MT has some of the toughest competition in the business. 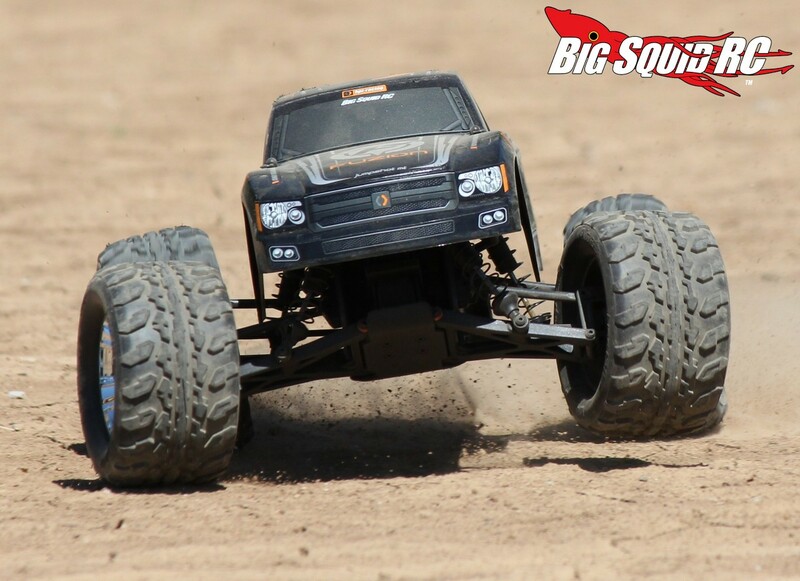 You can count the ARRMA Granite, ECX Ruckus, and Traxxas Stampede as some of the heaviest hitters in the class. What’s Needed To Complete: Nothing. Zilch. Not a dern thing. Everything you need to get driving comes right in the box. 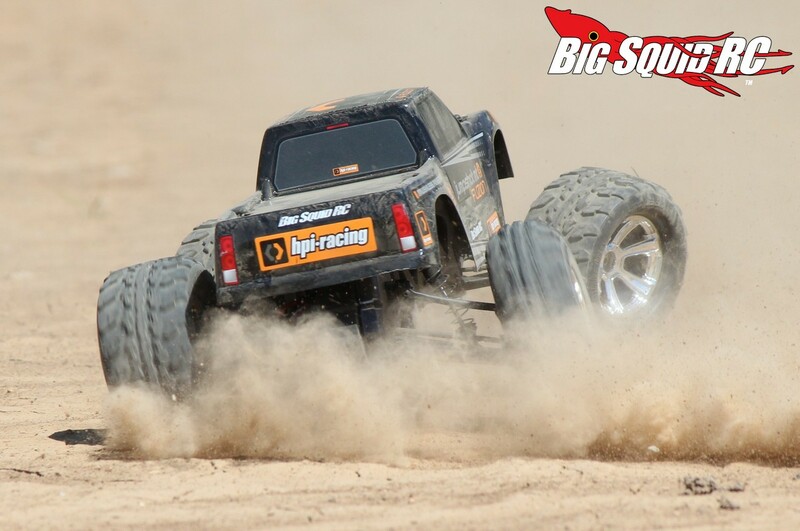 Build Quality: With HPI on the bounce-back we really checked the truck over to see how well it was assembled. We are happy to report that we only found one small issue. One of the front shocks was a slightly low on oil, otherwise our test truck was very well assembled. Test Drivers: Like all of our reviews, we enlist multiple people to get a wide variety of feedback. Our test crew for the Jumpshot MT included Iron Mikeee, Robbie G., T-Mohr, and yours truly. Test Venues: Places that we tested the HPI at included our local Costco parking lot as well as 2 different city parks. Set-up Notes: While we left the chassis and its settings stock, we did not use the included wall charger, instead we let a touch screen Duratrax Onyx 260 take care of charging up our packs. Also, we only ran the stock NiMH on two runs. The rest of the time we went with a Duratrax Onyx 2S LiPo for juice. 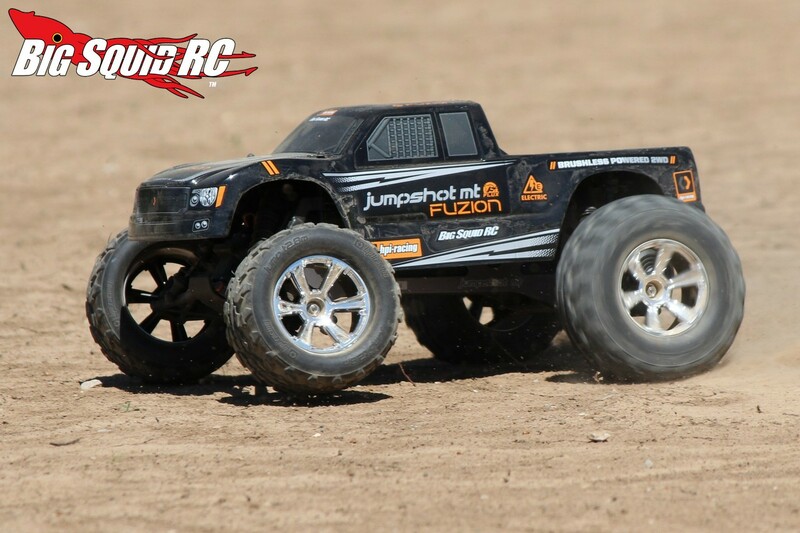 Turning: The Jumpshot MT is a bit light in the front like some of the other trucks in its class. At corner entry, it tends to plant well, but on corner exit you’ll need to stay light on the trigger finger to keep the front wheels on terra firma. The tires provide decent side-bite on most surfaces to help keep the corner speeds up. 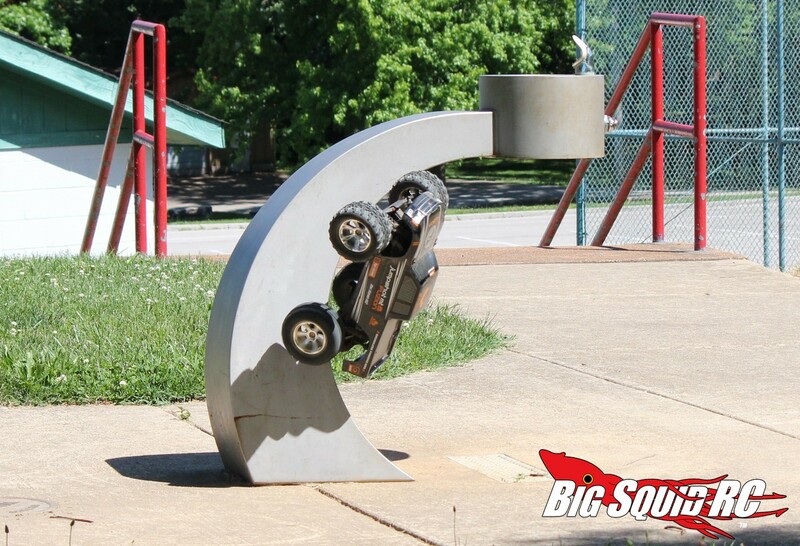 We didn’t notice much traction rolling on dirt, but it did have a tendency to roll when turning hard on pavement. Jumping: Oh yes, the HPI certainly loves to get airtime. The power system does a good job of making mid-air corrections and the truck did a good job of taking off straight, even on rutted jump faces. We found that the HPI tended to jump a bit nose high, which was easily corrected via a light tap on the brake. Bumps/Whoops: Pounding through the whoops was a blast with the Jumpshot MT. It was damped a bit soft on the front, but its big tires helped it go through rough sections at fast speeds. While the front had a small amount of excess bonce, the rear did a great job of soaking up all sorts of nasty terrain. On-Road: Do you like to wheelie? No, the truck won’t wheelie on the stock battery, but after popping in a 2S Duratrax LiPo, it loved to throw the front wheels at the sky. Yes, like pretty much every monster truck on the market, it would traction roll when turned quickly, but with good power on tap we had a blast driving the Jumpshot MT on pavement. Grass: Our test truck did a solid job in grass. 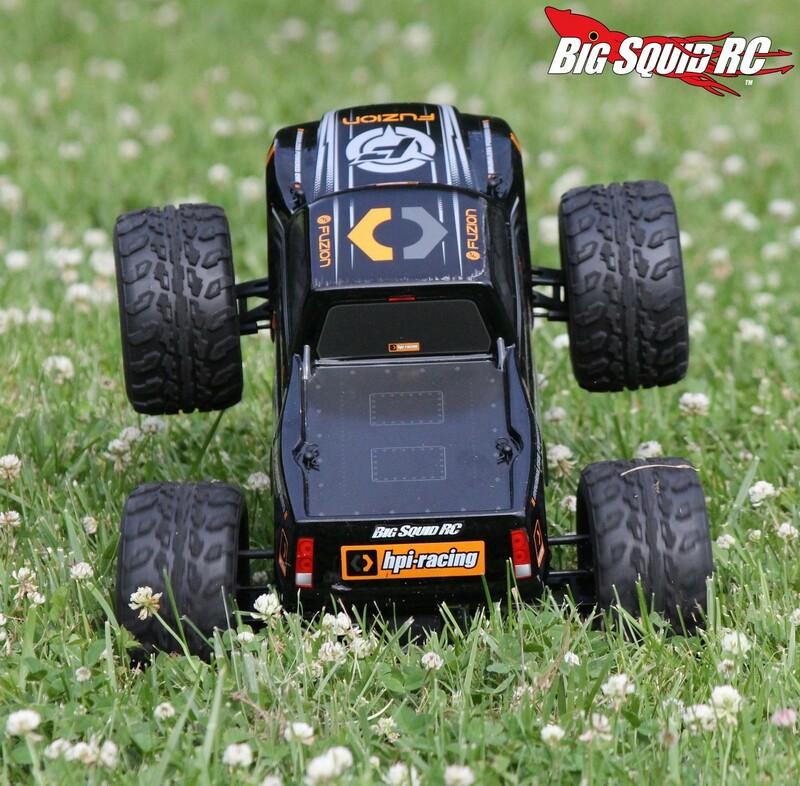 The big tires and brushless power helped it go through taller grass than we expected. Tires: The stock tires didn’t really excel anywhere, but were a solid choice for bashing on a wide variety of surfaces. The tires are molded from a fairly soft rubber compound. This gave them good grip on high bite surfaces. A relatively aggressive tread design gave them decent hook-up in the loam. The stock foams are slightly on the soft side, but not so soft that they really hinder performance. Power: The Jumpshot MT is a tale of two cities for power. On the stock NiMH battery, the power is docile and easy to drive. On a 2S LiPo, it instantly wakes up. 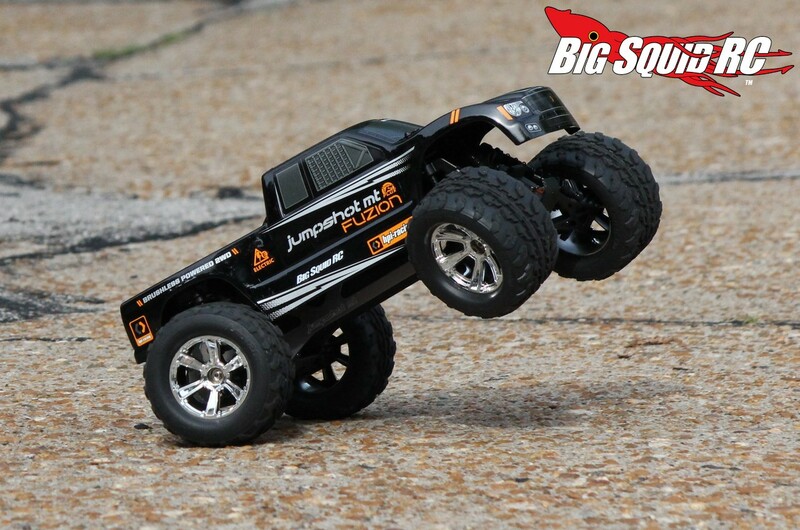 A LiPo allows the truck to easily spin the tires from a dead stop and allow it to pull massive wheelies. 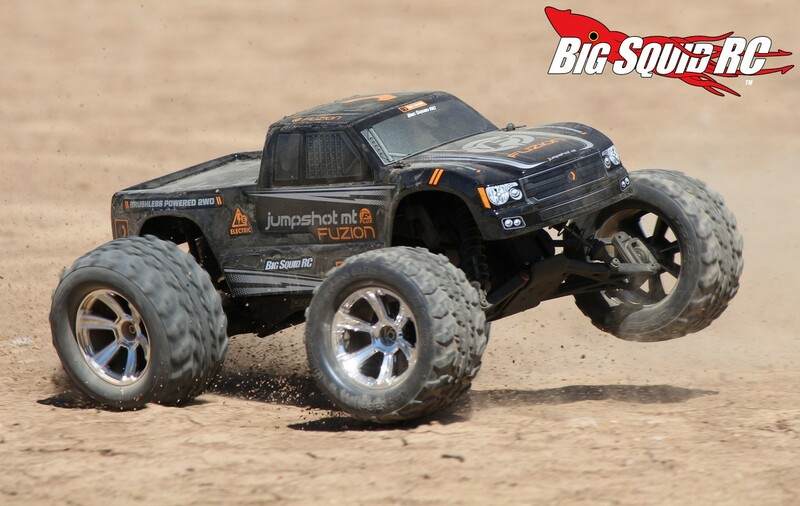 The NiMH is a perfect battery for a first time driver, while going to LiPo gave the truck enough zip to put big smiles on our test crew’s faces. Radio: The TF-40 worked well for us. The grip/wheel/trigger relationship fit a wide variety of hands and we never experienced a single glitch. No, we did not test its all out range, but we never ran out of range during our normal driving. The radio does use an external antenna, but we never felt the need to stand it up. Also, the stock radio comes with all of the basic adjustments that you will need, much better than some of the other RTR radios on the market. By the way, the spring on the wheel is quite soft, but that was something that we got used to after just a couple minutes of driving. After some beating on our test truck, the first thing that went out was the spur. We landed from a jump right on the rear of the truck. This caused the spur/pinion mesh to get out of whack for a split second and it was a goner. The Jumpshot MT uses a twin vertical plate chassis. The chassis is extremely rigid and held up fine for us. Speaking of that TVP, that necessitates the use of a bottom load battery tray. It has a decent amount of room for a battery, but the body clip that secures it can be a pain to get at with larger sized hands. We found that the stock gear diff worked quite well. We found the diff action to be buttery smooth. The ambient temps that we tested the Jumpshot MT in were quite hot. Most of our test days were 80 F and hotter. We found in these conditions that the stock motor ran fairly warm. After an 8 minute run we shot the motor can at 165 degrees. This means in hotter weather you will not want to run taller gearing, although you may be able to get away with it in colder temps or on shorter runs. So how about that Flux Fuzion power system? It is a 540 sized unit that comes with the speedo built in. Our test unit worked fine – no glitching, good power, and the power delivery was very smooth, even from a dead stop. 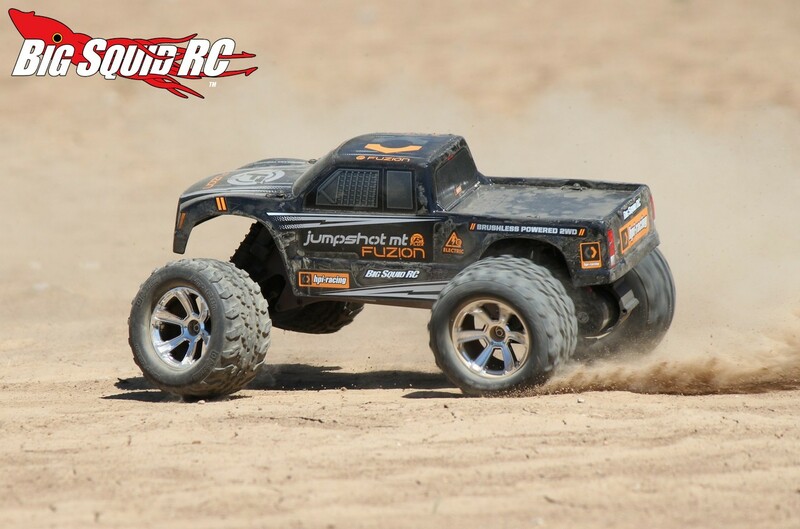 The body on the HPI was quite thin but ours held up well. After a few packs, the rear of the body was starting to show some serious wear from pulling wheelies all the time, but it held up better than expected. The HPI comes with a clear spur gear cover that makes it easy to check mesh, look for rocks, etc. Best Mod: This is an easy one folks. If you are a first time driver, use the included NiMH to learn how to drive. 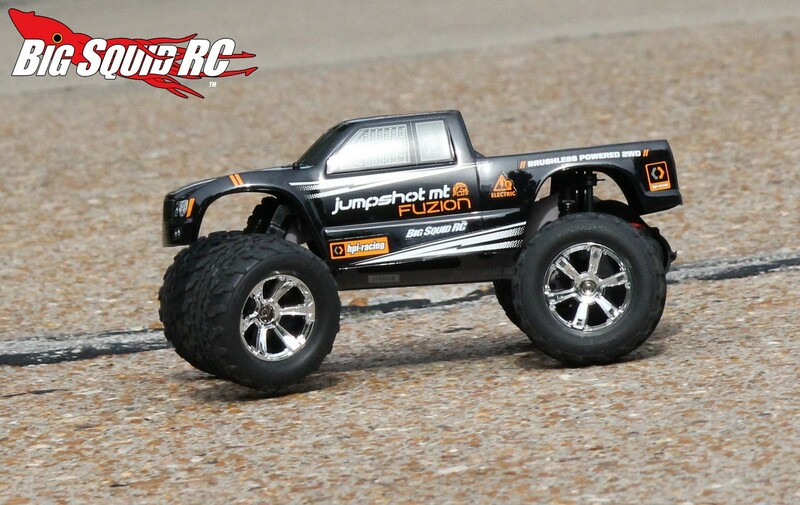 Right after that, pop in a LiPo to get a good taste of what brushless power is all about. Second on our mods list would be a wheelie bar. The Jumpshot MT loves to pull the front wheels off the ground, a good wheelie bar will make it easier to hold long wheelies, while also saving the back of the body. 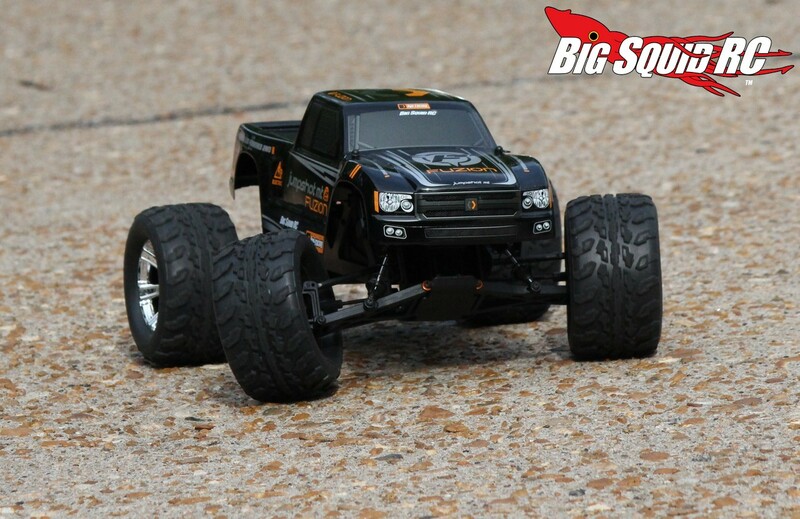 Time To Bash: B We found it quick and easy to take the HPI from the box to actually bashing with it. The wall charger can take some time, but it is a big plus that it comes with everything needed to drive inside the box. Workability: B While trucks with a twin vertical plate chassis can be slightly harder to wrench on than a traditional layout, we found the Jumpshot MT quite easy to work on. Car Show Rating: B Black is still a hot color and our test drivers loved the black body and graphics. The bright chrome wheels and aggressive tires also looked sharp. Bash-A-Bility: C After an errant landing, we ended up stripping out the spur gear. Fun Factor: B Having fun means different things to different people. 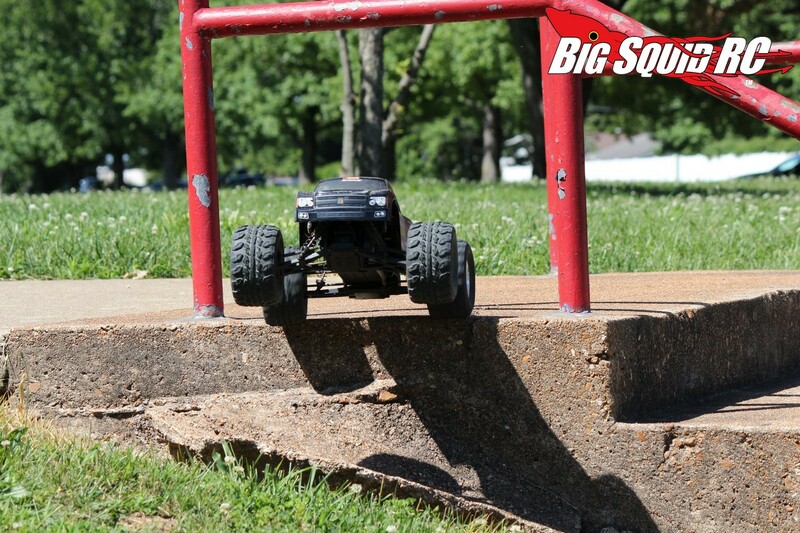 What the HPI is best at is blasting over rough ground and popping wheelies when running a LiPo battery. The Jumpshot MT did a great job of keeping a smile on our faces. Handling: B We found the truck to be solid in the handling department. Its best attributes were jumping and rough ground handling. 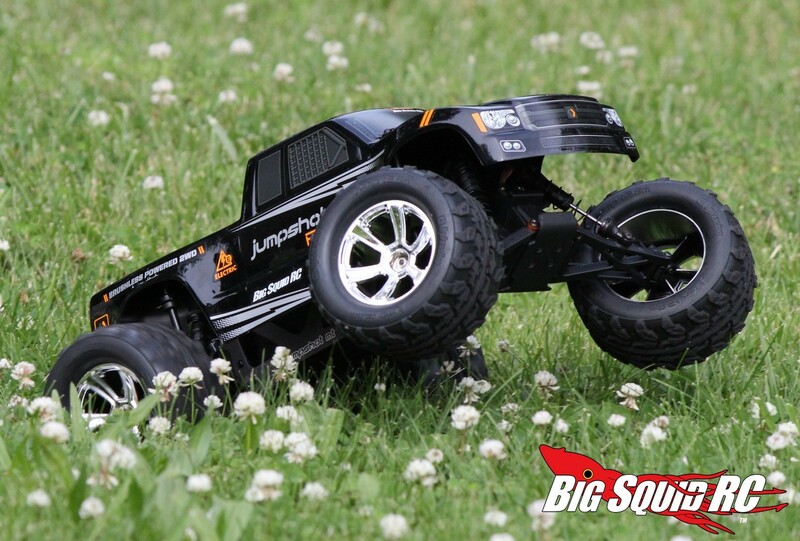 Value: A While other brushless powered 2wd monster trucks can run well over $300, the HPI comes in at a paltry $249. We feel that the Jumpshot MT offers a great bang-for-the-buck. Parts Availability: C After checking out Tower Hobbies, we found that they have a lot of parts in stock for the Jumpshot MT. The only downside is that not that many local hobby shops have them on their pegs. 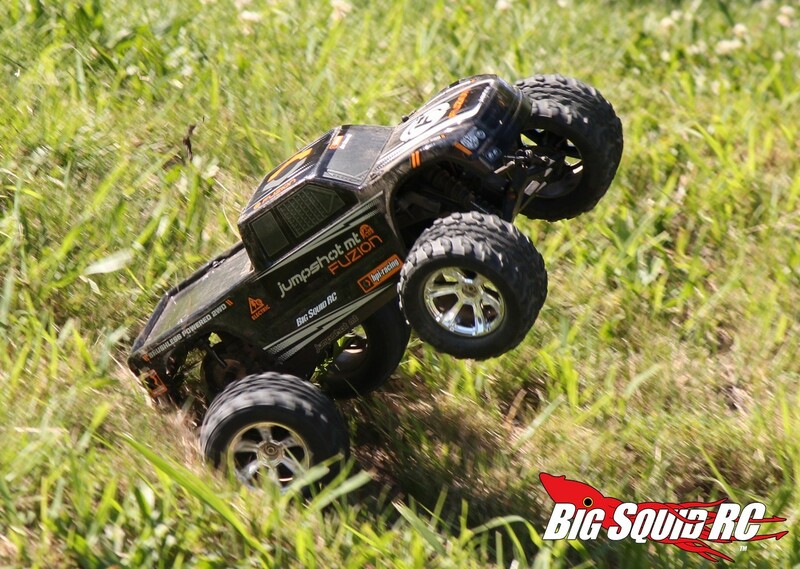 BigSquid Rating: B It was easy for us to tell that HPI put a lot of time and effort in the Jumpshot MT Flux Fuzion. 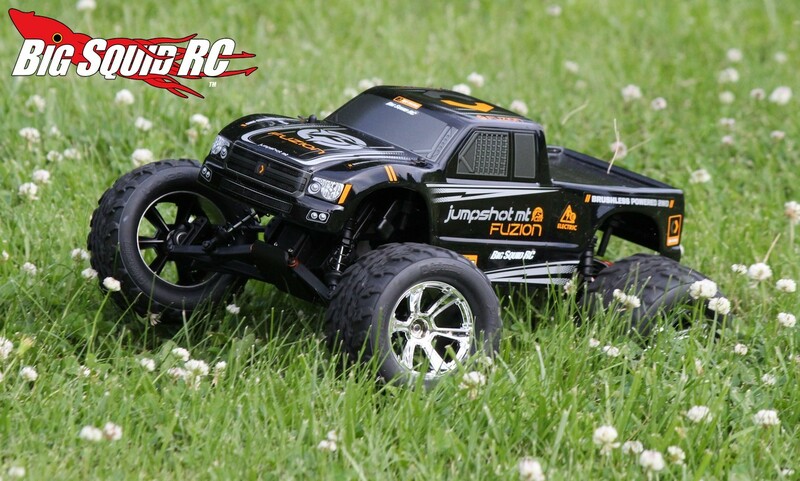 It has a great price point, and when driven on a LiPo battery, has a lot of power. We had a great time popping wheelies and catching big air with the Flux powered Jumpshot MT.